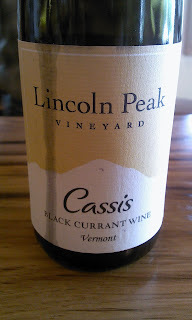 East Coast Wineries: Lincoln Peak Vineyards Winery (VT): Chris Granstrom Has a Secret! Lincoln Peak Vineyards Winery (VT): Chris Granstrom Has a Secret! There is something awe inspiring about what Chris and Michaela Granstrom have accomplished here in New Haven, VT...New Haven, VT?! Where the hell is that?! It's up by Middlebury for those not schooled in Vermont geography. And for those of us even down in the Hudson Valley, it's way the hell up there! But Vermont is beautiful, especially in summer, as I found out when I was a child, having spent a lot of time in Woodstock and the surrounding environs. 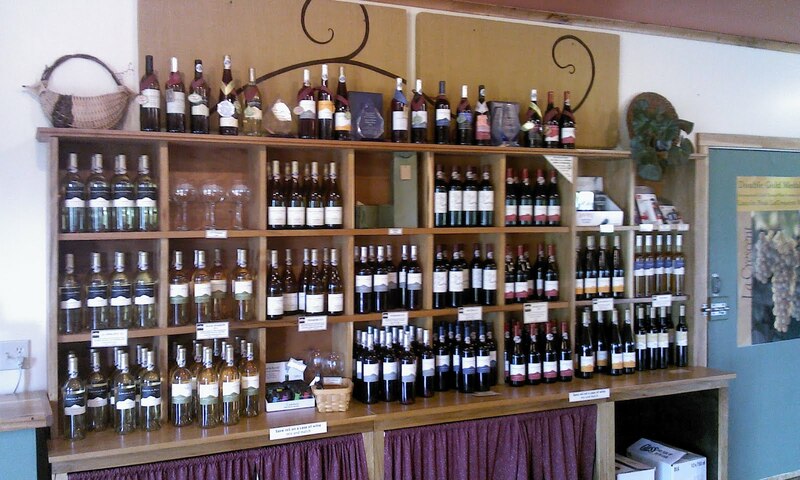 Anyway, Lincoln Peak Vineyards Winery is an amazing place. After almost 25 years of growing pick-your-own strawberries on the farm, the Granstrom family began planting cold-hardy grapevines in 2001. There are now more than 12 acres of grapes on their farm. 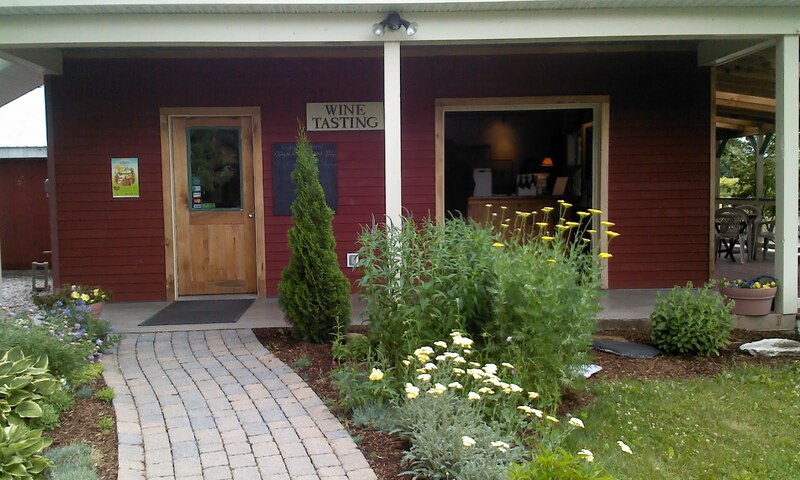 Grape-growing in Vermont is a hard enough enterprise. Here it is from their point of view: Grape growers in places like New England and the Upper Midwest used to be limited to a few varieties like Concord. Even these grapes didn’t always ripen in our relatively short growing season, and even when they did ripen, they were suitable mostly for jelly and juice. Their “foxy” flavor was nothing that wine drinkers wanted in their glass. But all that is changing. The University of Minnesota has an active grape breeding program, and they have created new varieties that not only survive the northern winter, but can be made into wine that is excellent by any standard. Another group of winter-hardy grape varieties was created by breeding programlate Elmer Swenson, a private breeder from Osceola, Wisconsin. Vineyards that will survive to minus 25, minus 35, some even to minus 40 degrees F. are now being planted in places like Minnesota and Quebec. Excellent wine is being produced and sold at these vineyards, and more vineyards are being planted as fast as the vines can be propagated. 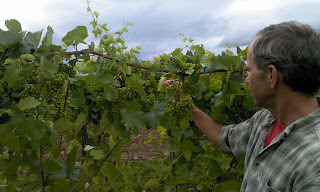 We specialize in these grapes at our Vermont winery, and are making excellent Vermont wine with them. We also have a few hardy table grapes varieties. The world of grape growing has truly moved North! To be clear, according to Anna Katharine Mansfield, a former memeber University of Minnesota enology department, "Marquette, Frontenac gris, Frontenac, and La Crescent were developed...by the breeding program at the University of Minnesota. Frontenac blanc is a natural mutation of Frontenac that was discovered simultaneously in vineyards scattered through MN, WI, and Quebec. Elmer Swenson's varietals include St. Croix, St. Pepin, Prairie Star, Edelweiss, and Kay Gray, to name a few." Lincoln Peak uses vines from both programs. And it's a family affair. Chris and Michaela run it. Their daughter Sara is also there! Chris Granstom has been farming in Vermont's Champlain Valley for more than 30 years. After growing apples and strawberries, Chris decided to specialize in growing cold-hardy grape varieties from the University of Minnesota and some varieties developed by Elmer Swenson. 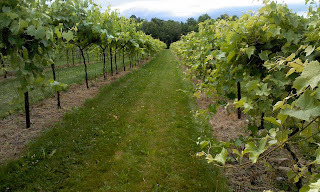 The Vermont winery soon followed the grapevine nursery. Michaela says she didn't know what she was getting into when she married a farmer. She was an art teacher – and still is – but life on the farm means that when summer rolls around, she jumps right into work in the vineyard. 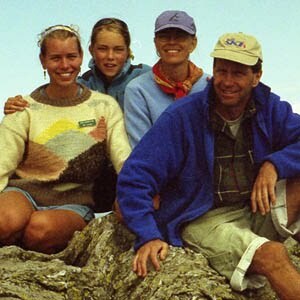 Michaela and Chris have raised two daughters on the farm - Sara and Maren. Sara Granstrom works the vineyard and tastingroom. After venturing out in other parts of the world (some distant, some not), Sara is back working in the family business again and couldn't be happier. 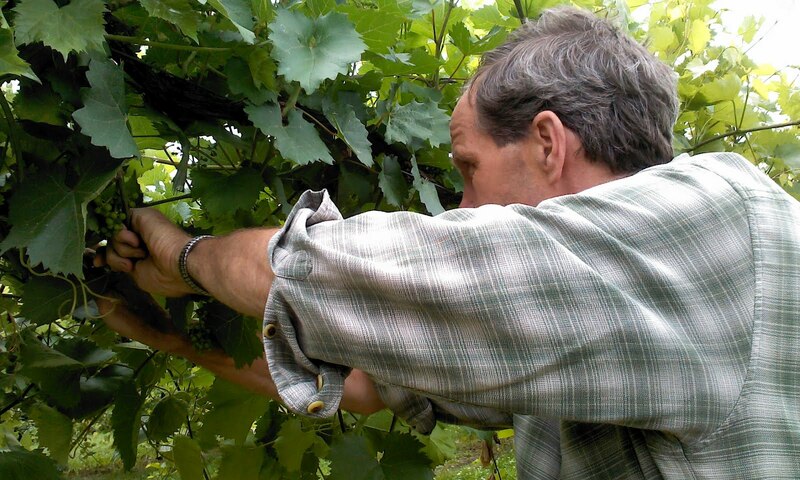 Erich Marn works in every aspect of the vineyard and winery, from pruning to winemaking. He's been an indispensable asset to the farm for several years. 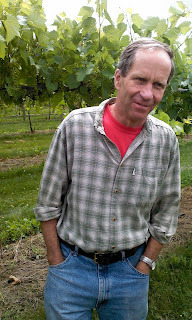 In his free time he takes care of his own vineyard in northern Vermont! The one thing about Chris is that he has become the poster boy for the cold weather varieties. He is sought after for one seminar after another. He is consulted, questioned, and his wines examined. He speaks when asked, and travels to learn. The reason? because he makes some of the best damn wine anyone is making with these grapes. Simple as that! But Chris has a secret to his success. He's a farmer! Even during my visit, when it wasn't raining (which it did on and off during my visit) the lack of rain meant the staff had to work the vineyards...thinning, positioning, etc. 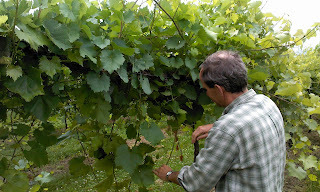 Chris (and his staff) can't touch the vines enough. Chris's real secret is he grows great fruit! Like all other wineries, the real secret is working the vineyard. For those who want to set it and forget it...those are the passable wineries. Chris is growing spectacular fruit...know how I know? Because I have seen it first hand. And I have tasted the wines. The flavors are incredible. During our tour, Chris showed how they grew the fruit. How they positioned it.How it works. And his plants had been pruned beautifully. They had been trained very well. They were almost picture perfect. Any time I see well cared for vines, I know the wine is going to be better than most.If you obsess about your fuit, the wine is sure to follow, because great wine is made in the vineyard, it can only be screwed up in the winery. Mother Nature and the vineyard workers do all the heavy lifting. 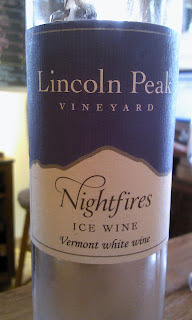 Firstly, Lincoln Peak is the largest estate winery in Vermont. And it's 100% estate! The other thing is when you taste their wines, you taste deep fruit an lush flavors. No off tastes. There's no green bell pepper, there's no grassiness, or other off flavors. 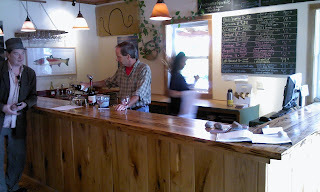 There are lush deep purple fruits and great tropical flavors....flavors you expect from great wineries. And let me tell you, Lincoln Peak is positioning itself to be a great New England winery. It absolutely is emerging as one of the best. There were no "Oooops" moments in my entire tasting. It was one solid wine afteranother. From wine to wine, from white to red, there was consistancy, flavors, and quality. That's why Lincoln peak and Chris are the stars in the Minnesota firmament. We(my travel companion for the day, Mark Young of Mexican Radio restaurant fame)arrived and were instantly greeted by the charming and beautiful Sara Granstrom (who looked at us as if we were kind of wierd - and let's be honest, who's to say I am not? I was clad looking like I was at a golf outing; Mark was the epitome of east village chic - what a duo). But she could not have been more accomodating, while we waited for Chris. Chris took us in the barrelroom where we tasted the 2011 Marquette. 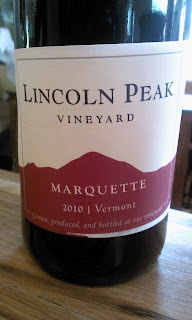 Now,Marquette is how Lincoln Peak has made it's name. And there is no question, that this wine would not disappoint. Bright cassis, raspberry, and blackberry all greeted me on the nose and on the palate. A touch of black pepper on the back end. Fantastic! And for 2011, which was a challenging year,I was impressed! Excellent! 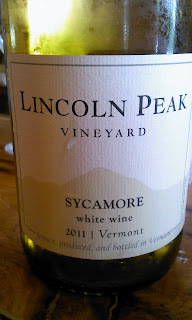 Sycamore 2011 is Frontenac Gris blended with Frontenac Blanc. It is a round and smooth dry white wine with notes of white peach and spice, and a hint of vanilla. A very pretty nose, with nice bright acidity. Very, very nice. 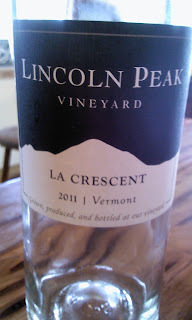 La Crescent 2011 has a livelynose of fresh pears, MacIntosh apples, and a hint of lemon and grapefruit at the end. Incredibly aromatic! 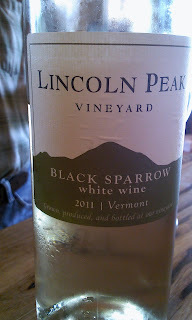 Black Sparrow 2011 is a blend og Louise-Swenson; Prairie Star; and Frontenac Blanc. Grapefuitandhoneysuckle come through as promised. Starlight 2011 is a rose' that features beutiful notes of light bright cherry and raspberry. Nice acidty. Light, refreshing. Marquette 2010 is a dark lush mixture of dark cassis, dark raspberry, and blackberry all greeted me on the nose and on the palate. A touch of vanillaand a finish of black pepper on the back end. Also some bramble flavors as well. Complex. Lot's of layers. 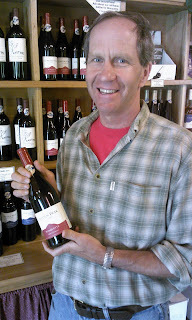 A fantastic wine, much like a fine Rhone wine! Fantastic!!! Everything it's supposed to be and more. Alright, this next one hurts. I HATE sweet reds. But this was a good one. 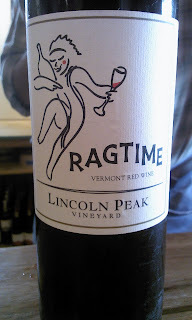 I had to have my arm twisted to try Ragtime (NV). Frontenac with some sweetness. But the acidity was high, so the balance was there. It had a refreshing kick at then end, like pink lemonade, rather than a sticky sweetness that rots your teeth. Even had some tannins. One of the best sweet reds I've ever had. Grrrrr....I hate writing that. Really good. 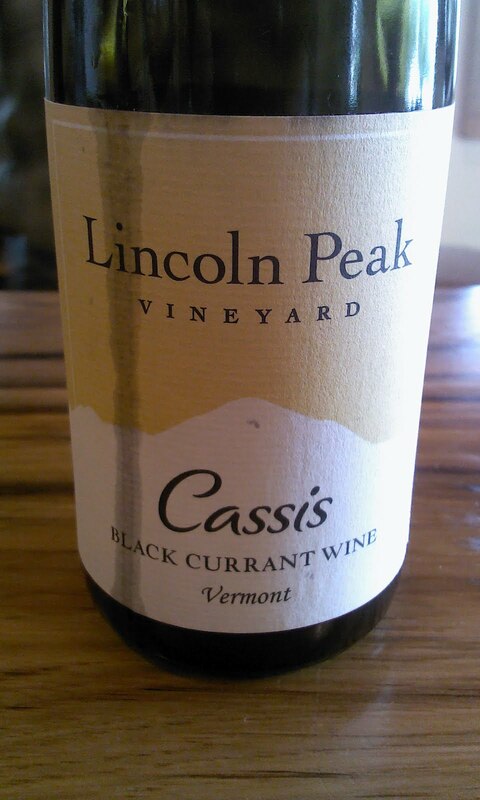 Cassis was also very, very well balanced. Medium bodied. It was a brighter, dark-red, with tinges of purple. Great acidity and flavor. Very, very nice. Late Harvest was rich with peach, apricot, and honey all coming through as followed. You can easilly understand after taking one whiff why this is one of theirmost popular wines in the tastingroom. Nightfires. OK....I love stickies. But they have to be goo. This is a good one! Super acidty, is balanced out by tropical fruits, peaches, apricot, honey, and citrus...wow!!!! Tremendous balance. Fantastic!!! The wines were all one better than the next. A fantastic visit. Quality wine. 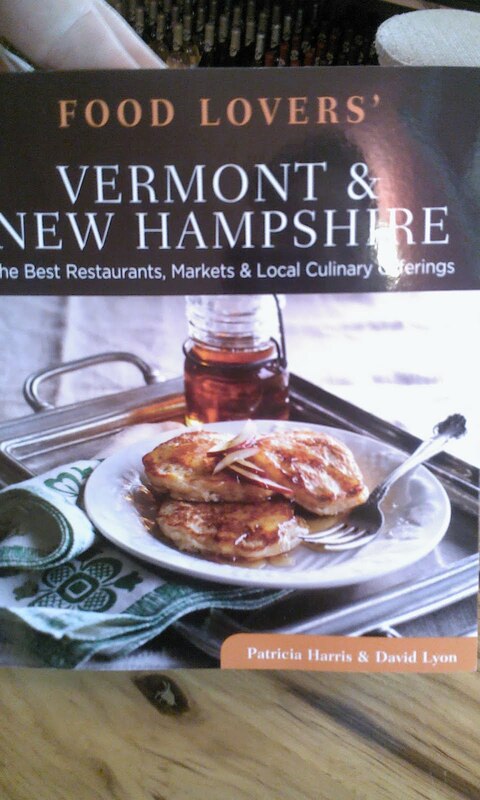 The Granstroms are doing something very special up in Vermont. You gotta get your hands on some of this stuff. With Sara and the young lady, Eliza, who was working the tasting room with her (from NJ no less, who'd recently married, and who had attended my high school (Notre Dame, HS, Lawrenceville, NJ)), you are sure to have a fantastic visit. postscript...the first posting of this story contained some inaccuracies regarding grape lineages. They have been corrected in this current post. I apologize for the mix-up.